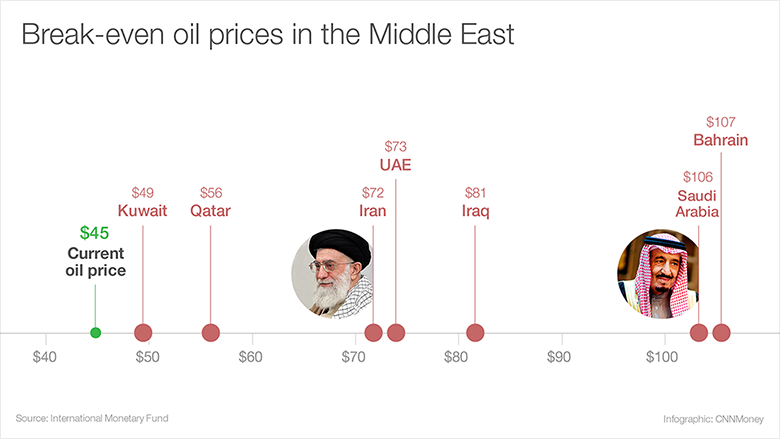 How long can the Middle East survive cheap oil? If oil stays around $50 a barrel, most countries in the region will run out of cash in five years or less, warned a dire report from the International Monetary Fund this week. That includes OPEC leader Saudi Arabia as well as Oman and Bahrain. 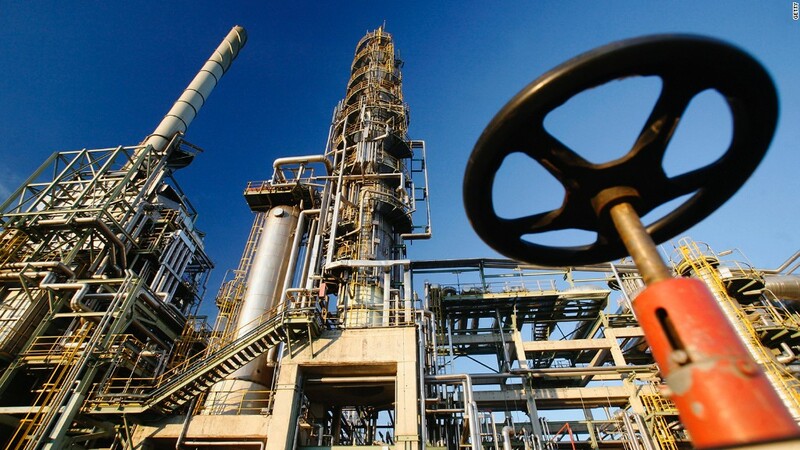 Low oil prices will wipe out an estimated $360 billion from the region this year alone, the IMF said. Huge budget surpluses are quickly swinging to massive deficits as oil prices have crashed to around $45 currently from over $100 last year. Many of these countries are being forced to tap into rainy day funds to weather the storm. The depressed oil prices have come at a time when spending has gone up as many of these countries are grappling with regional violence and turbulence in financial markets. Saudi Arabia, the world's largest oil producer, needs to sell oil at around $106 to balance its budget, according to IMF estimates. 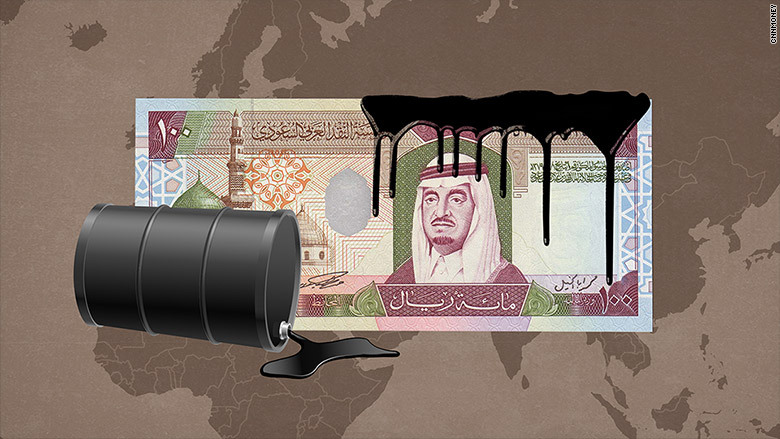 The kingdom barely has enough fiscal buffers to survive five years of $50 oil, the IMF said. That's why Saudi Arabia is moving fast to preserve cash. The kingdom not only raised $4 billion by selling bonds earlier this year, but its central bank has yanked up to $70 billion from asset management firms like BlackRock (BLK) over the past six months. After years of huge surpluses, Saudi Arabia's current account deficit is projected to soar to 20% of gross domestic product this year, Capital Economics estimates. Saudi Arabia's war chest of cash is still humungous at nearly $700 billion, but it's shrinking fast. Saudi Arabia is unlikely to jack up taxes, but it is poised to cut at least some forms of spending. It's not likely to cut social and military spending programs as leaders fear a repeat of the 2011 Arab Spring uprising. "In an environment with regional insecurity and domestic instability, to chip away at that social contract is a bit of a political gamble," said Henry Smith, a Dubai-based associate director with consultancy Control Risks. Yet Smith said big government spending projects are already seeing far greater scrutiny. "Some of the projects that are less economically essential are quietly being sidelined," Smith said. Iran's break-even oil price is estimated at $72 and it could survive cheap oil for less than 10 years, the IMF estimates. It's a rosier outlook compared to its neighbors. But Iran's outlook is clouded by potential sanctions relief (which hasn't come yet) and a surge in oil production from its nuclear deal with the West. Iraq has virtually no fiscal buffer remaining, according to the IMF. The country is grappling with internal strife and has lost large swaths of land to ISIS. "Violence increasingly affects civilians, and has a particularly adverse effect on confidence and expectations, and consequently on economic activity," the IMF warned. Bahrain is also under great financial pressure, with the likelihood of also running out of options in less than five years. The country already has lots of debt and has been running deficits for several years in a row. "They are in a relatively tight spot. They are going to have to undertake a more significant tightening," said Jason Tuvey, a Middle East economist at Capital Economics. However, a handful of countries are well positioned to face the storm. Topping that list are Kuwait, Qatar and the United Arab Emirates. That's partially because these countries don't need sky-high oil prices to balance their budgets. Kuwait's break-even oil price is estimated by the IMF at just $49, or just a tad higher than current levels. The magic number is believed to be $56 in Qatar, the host of the 2022 World Cup, while the UAE needs $73 oil. But these three countries have built up mountains of oil money that protect them during the leaner times. The IMF said the UAE has enough fiscal buffers to withstand $50 oil for nearly 30 years. Qatar and Kuwait can sustain cheap oil for almost 25 years.